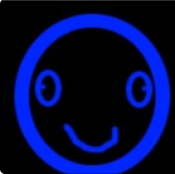 This game is a remake of an old, terrible fangame my friend made back in 2011. This game has (or will have) more characters, enemies, worlds and misc stuff than the original. It is as well currently active. The original game (And the current Remake) are based on an old retro game called Galaxian. 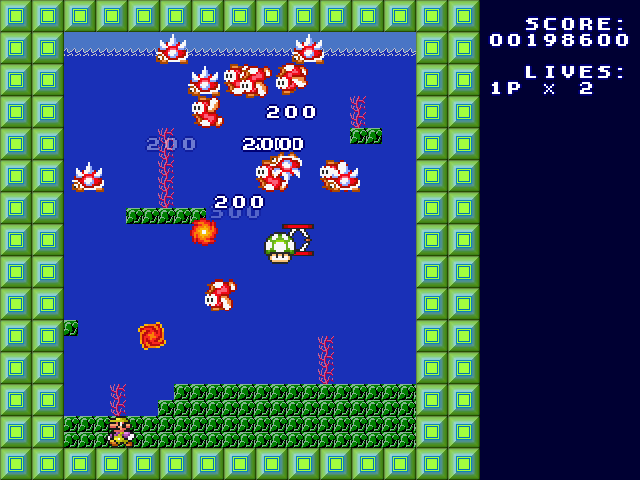 Goomba - Your basic enemies, just moves left and right. Sometimes go down. Koopa Troopa - Hides in his shell. While in his shell, he cannot be killed. Buzzy Beetles - Hides in their shell. While in their shell, all bullets that touch it are reflected back. Spiny - Moves much faster than the other enemies, so they get to the bottom faster. 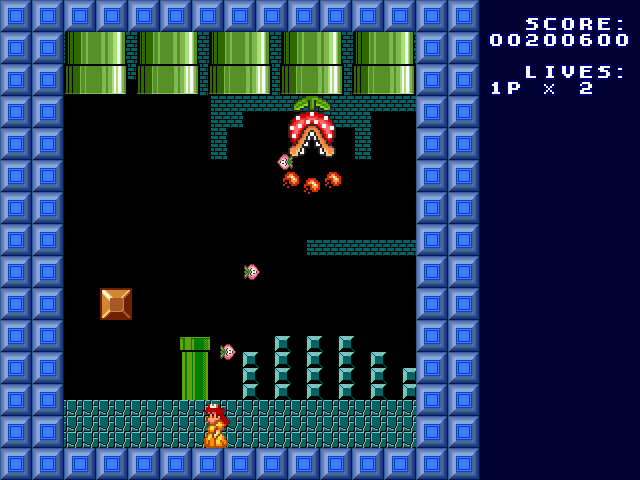 Bullet Bill - Constantly wraps around the screen left to right, while slowly descending towards you. If you let them go under the screen they'll reappear above. Bomb Omb - When killed, explodes and sends projectiles in 8 different directions. Hammer Bro - Throws hammers at the player every-so-often. 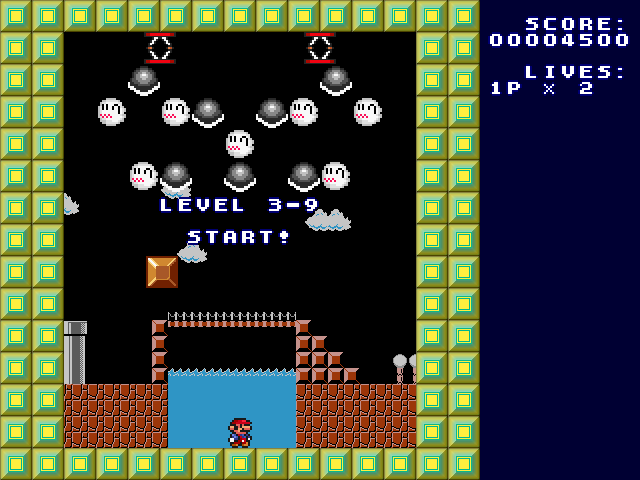 Shy Guy - Goombas that needs to take more hits to be killed. Missile Bill - Same as Bullet Bills, but faster and explodes like Bomb ombs. Boo - Turns transparent at times. Bullets just go through them in this state. Cheep Cheep - Advances down once they hit the wall. Hoopster - Just goes up & down on one column. Never goes left or right. 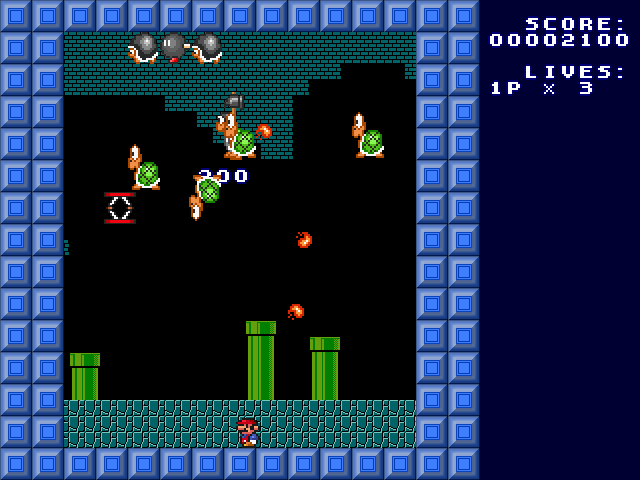 Red Koopa Troopa - Same as Koopa Troopas, however they move a little bit in their shell. Cheat codes are needed to jump to certain levels and unlock other characters. To access the Cheat Code menu, you got to type in 8675309 on the main menu screen REALLY fast. And yes, you need to figure out the full codes yourself...Just replace the asterisks with letters. *Possible graphics being updated to GBA. Rosalina isn't in the current version of the game. May not be a big deal for most people, but due to this site being 90% Rosalina fans, she will be added soon. 1.1 is like a demo of sorts. Due to the lack of certain features, unable to save the game, and the secret characters being only available through "Cheating" means. I most likely missed a couple additions to this topic that my friend had in his original topic on our website. I might re-add them later on. The game may end up mentioning me and my friend's website a couple of times in the game...hopefully the game doesn't get taken down off of this site because of that. Please remember, THAT THIS GAME ISN'T MADE BY ME! A friend of mine told me to post the site here (Or in other words, I asked him if I could) because he isn't exactly the type of guy that likes joining random sites.